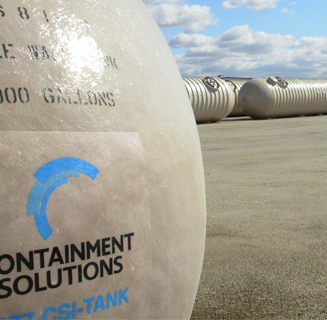 As a WaterTanks.com Premier Partner Containment Solutions Inc. provides competitive pricing with the highest quality customer service, and product offerings. Select a product category from the menu below to display the available product literature materials. If you are having trouble finding documents or for more information, please call us toll-free at 888-823-5960. Containment Solutions, formerly a division of Owens Corning, pioneered a technology in 1965 to manufacture the first underground fiberglass storage tank. More than 45 years and 300,000 tank installations later they continue to lead the industry in innovative, non-corrosive storage solutions both above and underground. Fiberglass water tanks, from Containment Solutions, are designed to meet AWWA D120, NFPA 22, NSF 61 and IAPMO Z1000 standards for water and wastewater storage tanks. Non-corrosive fiberglass tanks from CSI are lightweight and watertight making them the perfect storage vessel for any water application. Underground tank sizes range from 300 to 60,000 gallons. Containment Solutions’ fiberglass water tanks and cisterns are manufactured at multiple locations to serve North America. © 2019 Containment Solutions, Inc. All Rights Reserved.